Our normal "uniform" for James on holidays has been a sweater vest and corduroy pants. 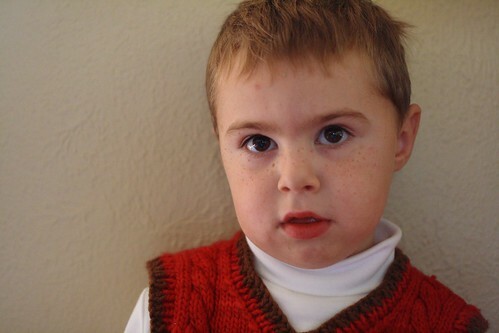 Last Christmas, we were having a hard time finding him a sweater vest that coordinated with the girls' Christmas outfits (unfortunately, all those photos were lost in the computer crash we had this year), so I just decided to knit his vest instead. It was a fairly last-minute project (I seamed the sides just as we walked out the door for Christmas Eve services), but so quick and cute. I had a silly idea in my mind that it was "too Christmasy" to be worn ever again, so it's been set aside in a basket of woolens ever since Christmas. As I've been planning for these knitting update posts (and there are more coming! ), I pulled it out to re-photograph it, and James has worn it almost every day since then. There is something so perfect about a vest. It's warm, but doesn't hinder the activity of a little one. And he really loves it. He tells me often how happy he is to have it. So, I'm really happy that I pulled it out for him this autumn! This was a great little knit, and looks so cute on him! This Christmas, I'm thinking of going for this one, or maybe this one. Oh, the planning is half the fun, isn't it?